UPDATE: Darwin resident Martin Eadie has kindly given his permission to publish one of his images of one of the the F-15SGs landing at Darwin. Click on the thumbnail for high res image. Thanks Marty! According to witnesses on the ground, six Republic of Singapore Air Force F-15SG Strike Eagles of 149 Sqn, normally based at Paya Lebar Airbase, have arrived in Darwin, Australia on the afternoon of the 11th of April. 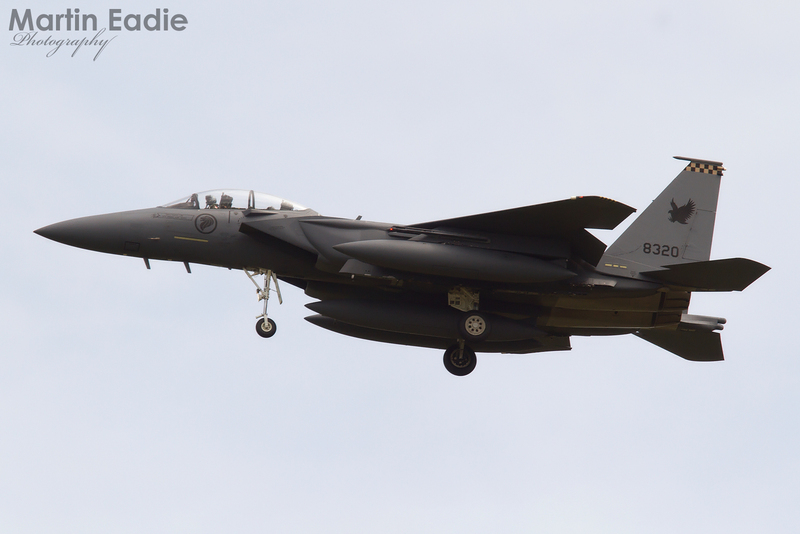 Noted arriving at RAAF Darwin were F-15SGs 8306 (05-0004; c/n SG4), 8315, 8318, 8319, 8320 and 8323. All were equipped for a long flight, carrying 3 600-gal tanks each. The Eagles were followed by RSAF C-130H 734 of 122 (Condor) Sqn which also landed in Darwin soon after. No tankers accompanied the F-15s into Darwin, however a RSAF KC-135R of 112 Sqn dragged the F-15s up to a point about 200km NW of Darwin before returning to Changi West, Singapore. It is believed that 149 (Shikra) Sqn, which had converted from the F-5S/T Tiger II to the F-15SG just over a year ago, are in Darwin for an exercise, expected to last several weeks. Singapore has ordered a total of 24 F-15SGs from Boeing between 2005 and 2007. All aircraft have been delivered as of early 2011, and the RSAF's F-15SG fleet is currently split between the Shikras and the Buccaneers of the 428th Fighter Squadron, 366th Fighter Wing, a joint USAF-RSAF training detachment based at Mountain Home Air Force Base, Idaho.